Potton Consolidated Charity is working with Bedfordshire Rural Communities Charity (BRCC) in an exciting new partnership and has generously funded the new post of Potton Community Agent. Andrea MacAdam will be working as your Potton Community Agent to help you access services you may need, to provide high quality information on issues you may be bewildered by and to help you make informed choices about your own life. 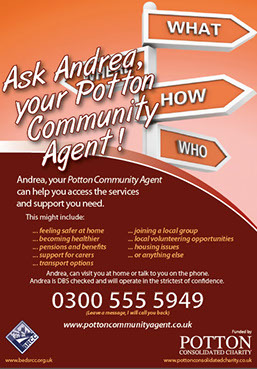 Find out more about how your Potton Community Agent may be able to help you ….